In a world seemingly intent on destroying itself, the humble capybara is a wholesome good. The oversized friendship guinea pig is a reminder of what humanity could achieve if we stopped yelling at each other on the internet. That’s why this week on Animals Are Good, we’re celebrating the world’s largest—and chillest—rodent, the capybara. Capybaras (Hydrochoerus hydrochaeris) live in social groups of 10 to 20 in the forests of Central and South America. They spend their days ingesting large quantities of grass (nice) and hanging out by freshwater streams and marshes. They even mate in the water, which we won’t get into as this is a family website. Though they are undeniably adorable, sometimes, capybaras can be a little gross. Capybaras have become internet-famous for their ability to befriend just about anything, from kittens to alligators. 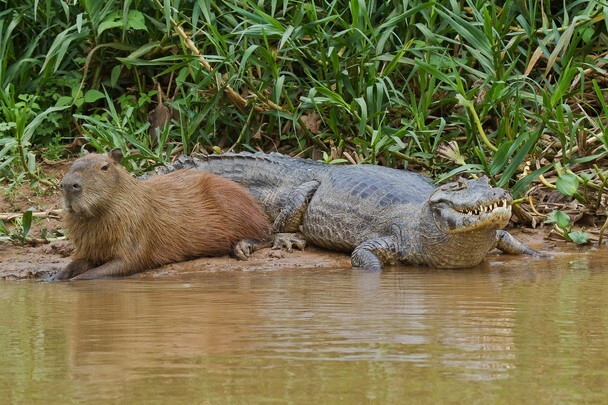 There are myriad photos of capybaras cuddling with with turtles, birds, and monkeys. No one really knows why capybaras are so magnetic—maybe they just know something about kindness and compassion humans don’t.